The Mythology and Associations: The ruler of Aquarius is Uranus. Its symbol represents water, a universal image which dates back into prehistory. This will also be recognized in the egyptian hieroglyph representing the same. The association in Aquarius is that of the servant of humanity pouring out the water of knowledge to quench the thirst of the world. These symbolic waves of water, share the dual expression of vibrational waves of electricity or parallel lines of force. Personalities: Aquarians are interesting and attractive people. They can be shy, sensitive, gentle and patient; or enthusiastic and lively with a tendency to be exhibitionists. Both types are strong willed and forceful in their own way. Very opinionated with strong convictions, they fight for what they believe in. They will argue vehemently for what they believe to be true, however, if you can show them facts to the contrary, they have little trouble altering their opinion. These are farsighted people with an eye and ear to the new and innovative. They are generally without prejudice and quite tolerant of the point of view of others. They have an interesting side to their nature that allows them to see a valid argument even when they disagree with it. They are quite objective folk and never get waylaid by being too close to an issue or person. Regardless of type, Aquarius is truly a humane, human being. Known to be frank and outspoken, a 'on my mind, on my mouth' type, Aquarius makes for a serious and genial companion. Refined and idealistic, romantic but practical, they are personable and likable people. Quick in mind and quick to respond, Aquarians love activity and are quite reasonable, though difficult to get close to. They cherish and guard their independence, and are a strange mixture of caring concern and cool detachment. They will go out of their way to help when needed, but never get involved emotionally. To fully appreciate the mythological significance of Aquarius, it is necessary to bear in mind the importance of water to our ancestors. The very existence of the ancients depended upon the supply of life sustaining moisture. During the month of Aquarius, the rains were on the land, literally poured from the heavens. In many regions of the ancient world, this was seen as the beginning the new year, a time of new life cycles. It is not hard to understand why some images depict the figure of Aquarius as a water bearing angel. The region of the night sky in which Aquarius resides is populated by water signs. In Babylonia, this region of the zodiac was known as the Sea. Here we also find, Capricornus, the water goat and Pisces, the fish. To the Greeks, Aquarius was associated with Ganymede, the son of Tros, king of Phrygia. The god Zeus, so admired the boy's beauty that he abducted him to serve as cup bearer on Mount Olympus. It was this desire to possess the young prince which inspired Zeus to cast his image eternally in the night sky. The Egyptians associated this time of year with the god Hapi. A heavyset, abundant figure, Hapi was responsible for the annual flooding of the river Nile. In some images he is seen watering the earth from two large jugs. In the 'Book of World Horoscopes' Nicholas Campion mentions at least seventy dates for the beginning of the Age of Aquarius covering a range of 1500 years. He forewarns his readers by stating that there has been much confusion over this issue, and quotes the noted astrologer Charles Carter's statement that more rubbish has been written about this subject than any other branch of astrology, which is probably, in itself, an exaggeration. As an illustration, Campion mentions an interesting synchronicity that occurred in 1962 involving a nineteenth-century French hoaxer and the renowned American clairvoyant Jeanne Dixon. In the 1890's Gabriel Jogand, primarily to agitate superstitious Catholics, deliberately devised and publicized a myth that the Antichrist was going to be born in 1962. On the projected day seventy years later, Jeanne Dixon had a vision that somewhere in the Middle East a baby had been born who would become a world teacher and lead humanity away from Christianity...an accurate definition of the Antichrist and also as a symbol of the beginning of the Age of Aquarius. 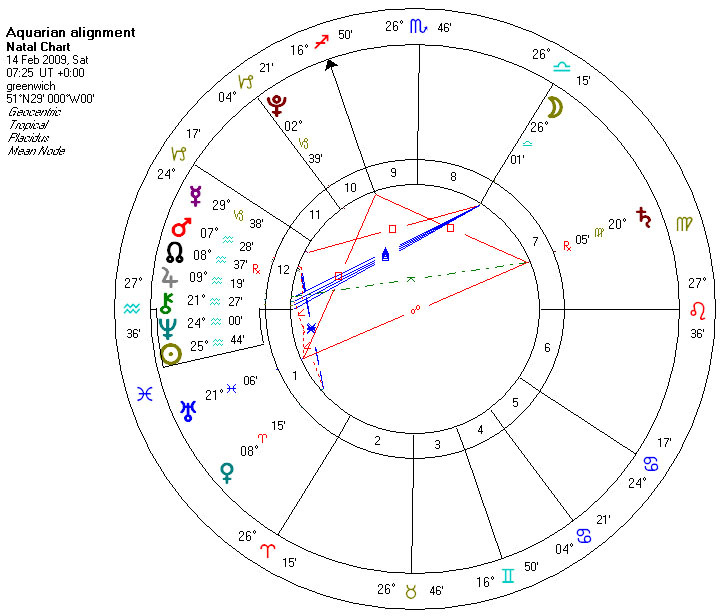 Campion constructed the horoscope computed from Dixon's estimated time and transposed it to Jerusalem and discovered that there had been a Solar Eclipse on the previous day when all of the traditional seven planets were in the sign of Aquarius. This is an interesting possibility for the entrance of the Age of Aquarius, but was not accompanied by an significant world events which would justify such a selection. This is also true of the majority of dates previously set for this momentous entrance...although enticing, they have not been persuasively connected with any major world events which would justify their claims. However, it could be reasons that the entrance into the Age of Aquarius is an inner, rather han an outer transformation, which could be the case. Many of the following proposed dates for the transition into the New Age of Aquarius are symbolic rather than astronomical or astrological, based as they are on intuitive datum points or perceived transitions. 1898: According to Hindu chronology, the Kali Yuga (Age of Iron) began in the year 3102 BC. As the yuga has a duration of 5000 years, its end occurred in 1898. 1904: Aleister Crowley in the Book of the Law, dictated to him by a discarnate Egyptian entity, proposed April 1904 in Cairo.when the channeling occurred, as the beginning of the New Aeon ruled by Horus, the solar god of ancient Egypt. 1921: The Jockey Club of Barcelona received tremendous backing for a prediction that the world would end at this time. 1936: Edgar Cayce stated that during 1936 the terrestrial axis had begun to shift, an exorable process which would activate the transition between world ages. The change would accelerate rapidly, with catastrophic consequences. A well-known American geologist confirmed that this axis shift did indeed begin below the Earth's surface in 1936. 1962: Peruvian spiritual messenger Willaru Huayta of the Quechua Nation, a part of the ancient Inca confederation believes that the Age of Aquarius began in February, 1962. 1975: Rudhyar designated 1975 as the time when the Avatar of the New Age would appear. He allowed the possibility that it might not be the Second Coming of Christ anticipated by many, but that the Christ energy could be carried by a series of individuals who would be agents for this message. 1975: A. Woldben in After Nostradamus suggested a range of dates including 1975, 2000, 2023, and 2160. He stated that the transition of world ages is never exact and can take hundreds of years because they constitute a modification in collective consciousness. 1987: In August Jose Arguelles organized The Harmonic Convergence which was a foretaste of the imminent New Age. 1997: Carl Jung was inspired by the work of Nostradamus and supported his contention that the New Age would happen between 1997 and 2000. 2000: There are many prophecies which agree that the Millennium year is 2000, among them those of Nostradamus, Edgar Cayce, St. Malachy, Garabandal, Fatima and other Christian prophets. Margaret Hone in The Modern Textbook of Astrology gives the year 2000 as a symbolic date for the new Age. The seer Catharine Emmerich believed that Lucifer would be unchained in 50 or 60 years before the year 2000. The theory of The Divine Plot, by this author, is an astrological model of the historical process expressing multiple cyclic world ages, and it projects a transition to a new world age in the year 2000. I believe this astrological alignment is very significant and would very much appreciate your sharing as widely as you feel appropriate. Please note that the chart itself is an attachment. In mid February a rare astrological concentration brings together a number of planets together with the North Node - denoting higher purpose - in Aquarius that energizes and inspires the possibility for transcendental breakthrough in some perhaps seemingly intransigent situations. We measure our global sense of both space (latitude and longitude) and time (universal time - UT or GMT) from the prime meridian located at Greenwich, England. So we can perceive the collective influence of this momentous astrological event by looking at the alignment from this globally �centered� perspective. When we do something extraordinary and exquisite emerges. At dawn on 14th February the day dedicated to St Valentine, the patron saint of Love, the Moon in Libra enters the seventh house of relationships. And Jupiter and Mars are aligned in Aquarius in the twelfth house of spiritual transformation. and Jupiter aligns with Mars. At dawn on 14th February the Cosmos actually embodies this perfect alignment to support our collective manifestation of love and peace and dawning of the Age of Aquarius. The Aquarian chart of 14th February reveals an incredible concentration of cosmic influences blending with the energies of Aquarius in the twelfth house. Expansive Jupiter and energetic Mars are aligned with the higher purpose of the North Node. The presence of Chiron the wounded healer offers us the opportunity to heal the schisms that have separated us for so long. Neptune emphasizes collective humanitarian movements and the co-creation of social justice. And the presence of the radiant Sun enlightens the entire alignment. Mercury also in the twelfth house but just beyond the cusp in Capricorn, allies with transformational Pluto to communicate and anchor the Shift throughout our global structures and institutions. The Moon in Libra in the seventh house emphasizes harmonious real �ationships. Venus in Aries in the first house energizes and empowers dynamic co-creativity. And whilst Saturn the great task master in opposition to Uranus the unexpected awakener is suggesting an ongoing confrontation as the dregs of the unsustainable old paradigm reluctantly give way to the untested hope of the new, their placements in Virgo and Pisces brings practical altruism and visionary inspiration to the transition. At 7.25am on 14th February � and for the 18 minutes of the alignment, I invite you, in the universal heart, to add your own intention for love and peace and to co-create the dawning of the Age of Aquarius to that of the Cosmos. In whatever way feels appropriate for you, you may choose to align with7.25am (UT) or 7.25am local time energizing a wave of intention that will surge around the Earth. Please feel free to circulate the Aquarian chart and its cosmic invitation to birth the Age of Aquarius. 2012: Terence and Dennis McKenna in The Invisible Landscape advance an idea derived from studies of primitive shamanism and psychoactive drugs that our universe is created by the holographic interaction between two hyper-universes, and the Universe if cyclic and recurrent.Based on extensive computer modelling, they think that humanity will experience a Resurrection into the Light during six days in Ad 2012 when, in the last 135 minutes, eighteen barriers, comparable to the appearance of life, the invention of language or the achievement of immortality will be experienced, thirteen of them in the last millisecond. 2012: Jose Arguelles discovered a system of cycles based on the ancient Mayan calendar and determined that the year 2012 would be the end of the 396 year Baktun of the Transformation of Matter, the collapse of global civilization with a following era of information and crystal-solar technology and galactic synchronization. 2025: The Tibetan Djwhal Khul, speaking through Alice Bailey, stated that the Fourth Ray comes into manifestation in 2025, bringing qualities for preparing the discrimination and balance required for the intellectual and emotional refinement of humanity. Humanity will the be able to function more completely on the intuitional plane. 2059: Rudhyar in The Lunation Cycle.There is a disagreement over this and the following date in Rudhyar's work. 2060: Dane Rudhyar determined that the last precessional Age of Pisces began in 100BC and since a world age is 2160 years, the official Age of Aquarius begins in this year. He considered that the last 10 percent of each age is its Seed Period during which its influence will begin to be felt and experienced. He mentions that in 1844 a young Persian prophet announced the end of the Islamic era and the beginning of the New Age, the avatar of which would announce himself some nineteen years later. One of his original followers proclaimed himself Baba u llah (Glory of God) the Expected One, And , in 1846 the planet Neptune was also discovered. Rudhyar believed that the new cycle had already started to release it spiritual-archetypal energies, which are now making their way downward into manifestation, producing a radical upheaval of public institutions focusing around the time of the massing of planets in the sign Capricorn, the ruler of large-cale political organizations.This would constitute a 'rite of passage' for all humanity and, in the destruction of existing and faulty ways of perceiving and organizing the world, humanity would discover a new way of life. 2160: Gordon Strachan in Christ and the Cosmos follows the standard precessional age of 2160 years using the birth of Christ as his datum point. 2874: Based on his mathematical analysis of the Great Pyramid passages, Morton Edgar set this date as the completion of Christ's Day of Restitution when the world will have gained all it has lost throughout history. 2915: Edgar Morton stated that in this year, forty years after the preceding date, the Redeemed Race will experience to the full the glorious liberty of the children of God, with complete dominion over the Earth. The dates and attributions stretch all the way ahead to Robert Hand's use of precessional movement combined with the actual size of the constellation Pisces in the sky, to arrive at the date of AD 2813, and beyond to the year 3550. It is clear from the preceding that the date of the entrance into the Age of Aquarius is anything but definite and it would seem that almost everyone has his or her version of the exact point. It is certain that the transition is in the process of taking place and it will have a great impact upon all humanity. HAS THE AGE OF AQUARIUS ARRIVED? The following month, the great solar eclipse will take place. Joan Sckrabulis has written a great book about the 1999 eclipse, called The Lost Covenant.